Course rating is the foundation of the USGA Handicap System. Without it, you wouldn’t be able to post scores or maintain a Handicap Index. With it, you can use your Handicap Index to compete equitably with any golfer at any course. 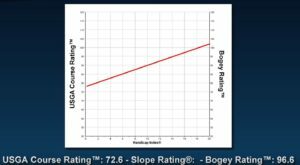 How is the Course Rating calculated? The Course Rating is designed to assign a numerical value to represent the difficulty of the course for a scratch golfer. This number is calculated by measuring the fairways, inspecting the bunkers, measuring the size and contours of the greens, determining the distance to hazards and out of bounds locations, etc. After rating the obstacles, the rating team plays the golf course to gain greater insight, from a playing perspective, and to clarify any doubts or questions that may arise on specific holes or shots. There are 26 evaluations for each set of tees on each hole, meaning that thousands of evaluations are considered for each course. While this used to be an all-day process back in the days of rope and string, it now only takes a few hours thanks to the use of GPS and lasers. The slope of the line on this graph (having high school algebra flashbacks?) is used to determine the Slope Rating, which is a measurement of how much more difficult the course plays for a bogey golfer versus a scratch golfer. 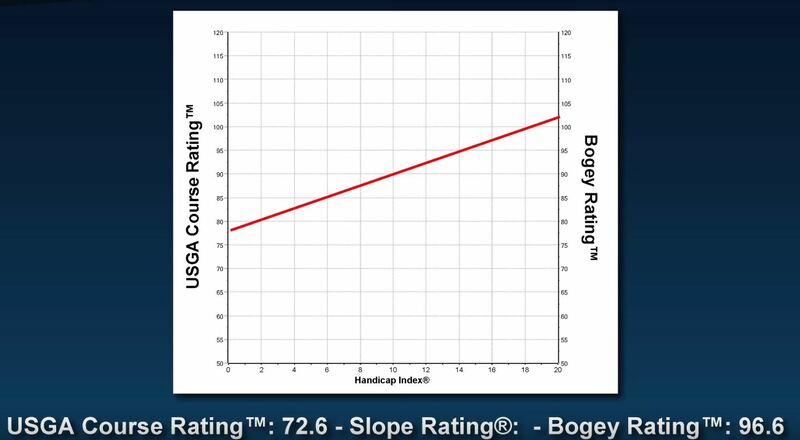 The Slope Rating can range from 55 (very easy for a bogey golfer) to 155 (very difficult), with 113 being the average slope. Each course is rated by a team from the golf association in their region. These teams usually consist of an experience staff member and volunteers that have been trained under the USGA’s Course Rating System. The USGA requires that all courses are re-rated every 10 years. However, ratings may occur more frequently if there are significant changes or renovations made, either to a specific hole or the entire course. Not sure how many strokes you should get in your weekly game? Want to test how your game holds up at the toughest courses in SoCal? 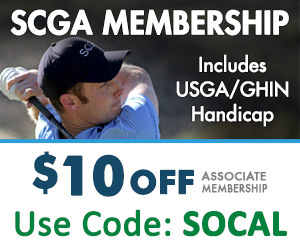 Join the SCGA today, establish your Handicap Index, and let the Course Rating System tell you exactly how good your game is. Copyright 2015, Southern California Golf Association (SCGA), All Right Reserved.